I want to preface this post by admitting that I once lost in round 1 of a regional spelling bee because I misspelled a three-letter word. The word was nil and I was definitely old enough to know it means nada/nothing/zero, as in the number of Reds World Series wins in my lifetime. Therefore, I was also old enough to know it is not spelled like mill, but I made the mistake anyways because well, we’re all human, right? Yes, the world is an imperfect place and yet it seems to get more imperfect every day. Lately, I’ve been stumbling upon an appalling number of spelling and grammatical errors in public places and on printed, glossy things. Printed, glossy things that have real live people being paid to ensure they are properly edited and do not have errors. 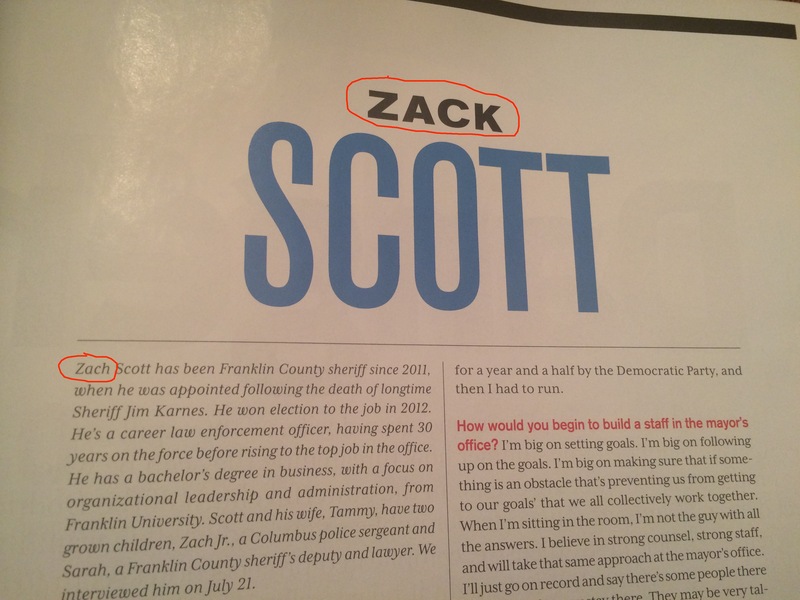 1.Columbus Monthly – Zack Scott or Zach Scott? 2.Columbus Crave – By Land-Grand Brewing, do you mean Land-Grant? If you know that Land-Grant is “up-and-coming” in the Franklinton neighborhood, I feel like you’d also know what it’s called. Though, Land-Grant does brew “grand” beer, for what it’s worth. I really hate to call out a company that sells cute stuff on sale, but alas, a glaring mistake in the subject line is too much. Considering I read ONLY the subject line on the majority of my personal email (that which falls in the promotional tab anyways), I’m thinking companies, brands and the like should take an extra minute to proofread. This one is more of a pet peeve, less of a spelling error, but I think it’s funny. Though pasta and vegetables are two very different type of carbohydrate, they are both, in fact, carbohydrates. Sure, I should eat more veggies probably, but just because they’re healthier than pasta doesn’t mean they’re not carbs. Don’t play me like that, Clean Eating. Well, that concludes this edition of Little Red Ink. 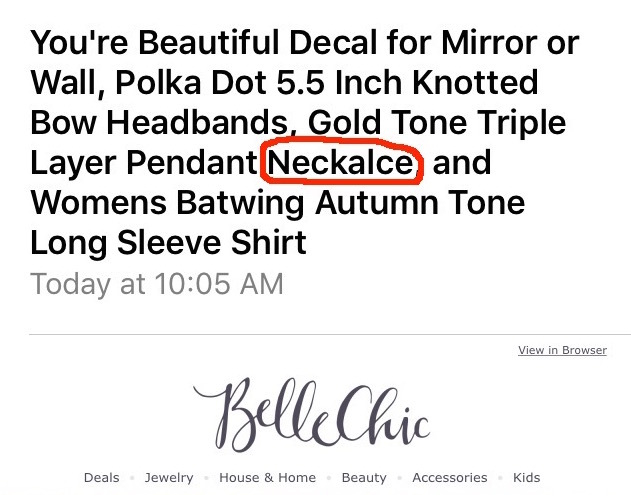 I do want to clarify that I am a loyal subscriber to all publications mentioned and I have purchased items from BelleChic. I’m not trying to throw hate, just spread the love of language that a few of our editors may have forgotten. Until next time, happy spelling!